1. Using a blender or food processor, grind cereal to a breadcrumb-like consistency. Season crumbs with the spices and transfer to a plate or bowl. Set aside. 2. Fill a small bowl with egg substitute. Prepare a baking sheet (or two) by spraying with nonstick spray. Set aside. 4. One at a time, dunk each ring in egg, give it a shake to remove any excess, and then coat it in the seasoned crumbs. Evenly place rings on the baking sheet(s). 5. Bake in the oven at 375 until outsides are crispy and insides are soft, 20 – 25 minutes, carefully flipping rings over about halfway through. 1. 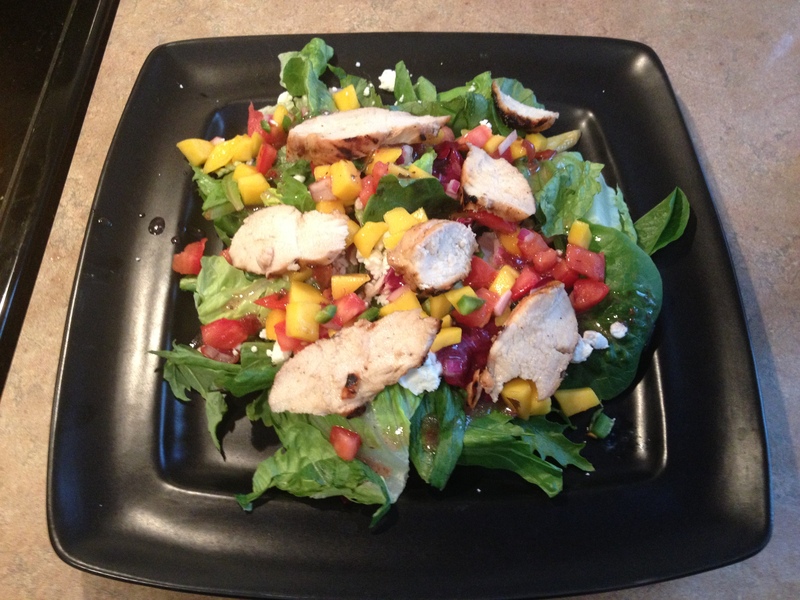 Make Mango Salsa: Mix all ingredients for salsa together, and refrigerate. 2. Lay lettuce on foundation of salad. ** calories calculated using hidden valley farmhouse originals pomegranate vinaigrette- 2 tbsp. 1. Add the olive oil to a 3-quart saucepan over medium heat. 2. Add the onion and bell pepper and cook for about 5 minutes, or until the vegetables are soft. 3. 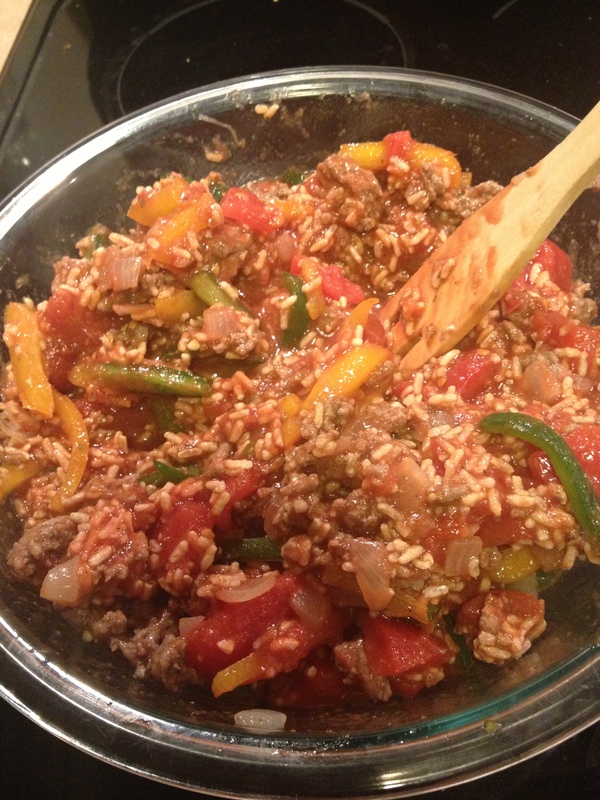 Add the tomatoes, garlic, bay leaf, chili powder, cumin, oregano, and 1 teaspoon salt, and simmer for about 3 minutes. Carefully add the broth and beans. 4. Bring to a boil, reduce the heat to low, and simmer for about 10 minutes, stirring regularly, until the mixture is thickened and most of the broth has evaporated. 5. Remove from the heat and discard the bay leaf. 6. Stir in the vinegar and cilantro. Season to taste with salt, black pepper, and chile flakes, if desired. Keep the bean mixture warm. 7. Transfer the tortillas one at a time to a nonstick skillet over low heat and heat them for several seconds on each side to soften and warm them. Transfer them to your work surface. 8. Sprinkle each warm tortilla with 2 tablespoons of the cheese. Top with ½ cup hot bean filling in the center of each tortilla. 9. Fold 2 sides of the tortilla in over the bean filling, then roll up the burrito from an unfolded edge. 10. Place 1 burrito, seam side down, on each of 8 plates. Top with salsa and scallions. *HINT: I like to serve with a little reduced fat sour cream on top, and jalapenos. YUM-O! My 2nd 5K! Glow in the night! 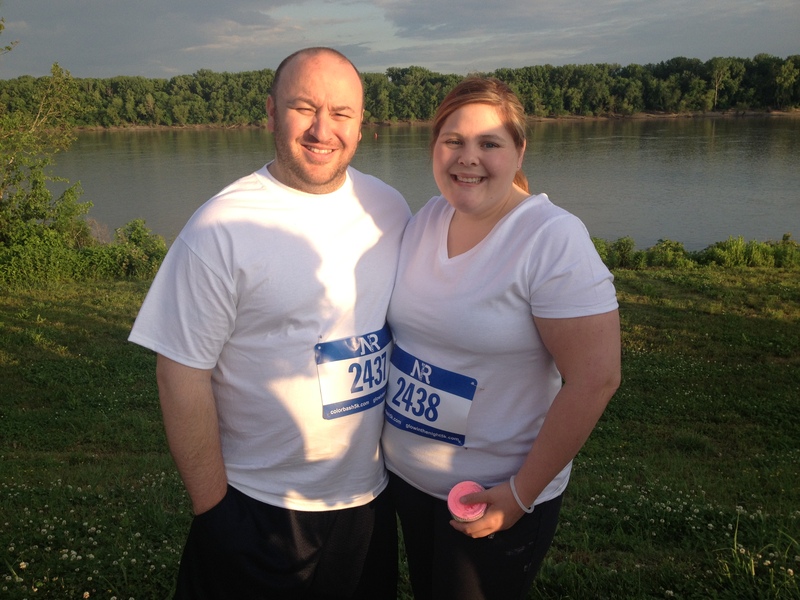 So, a couple of months ago, I reported that my husband and I had walked our first 5k, which was exciting. We pushed the stroller the whole way, so I was literally just walking the whole time, and I finished in 1 hr 6 minutes. Last night, we did a “glow in the dark” color run (where they throw all the colored powder at you along the way…) and it was super fun. We had a good time hanging out with a few of our friends and walking/running the course. My husband improved his time to finish in 32 minutes!!!! And I finished in 43! I can’t wait until the day when I can run all 5k’s, but for now, I’m pretty darn excited about this! 1. Cook Beef, garlic, and onion together, and drain fat. 2. 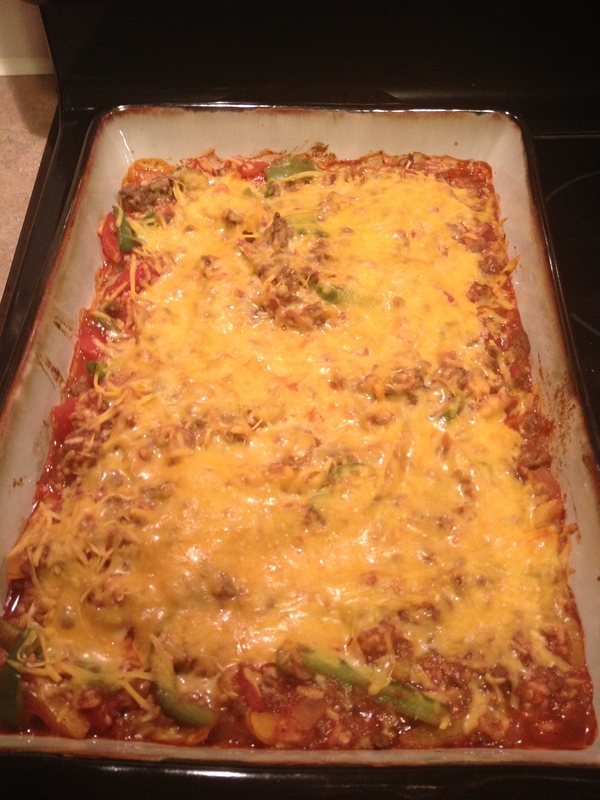 Mix all remaining ingredients except for cheese, and pour into a 9X13 pan. 3. Top with cheese, cover with foil and bake at 375 for 30 minutes. Wait! I know what you’re going to say… “cauliflower!? yuck!”. You’re wrong on this one. Trust me. THIS IS DELICIOUS and I have never met a cauliflower I liked. I also make this with a mix of fresh carrots, broccoli, and cauliflower. 2. Combine cauliflower and garlic in a large bowl. Drizzle with olive oil, lemon juice, salt and pepper. 3. Transfer, in a single layer, to a large rimmed baking sheet. 4. Roast at 450 degrees F for about 25 minutes, stirring once. 1. 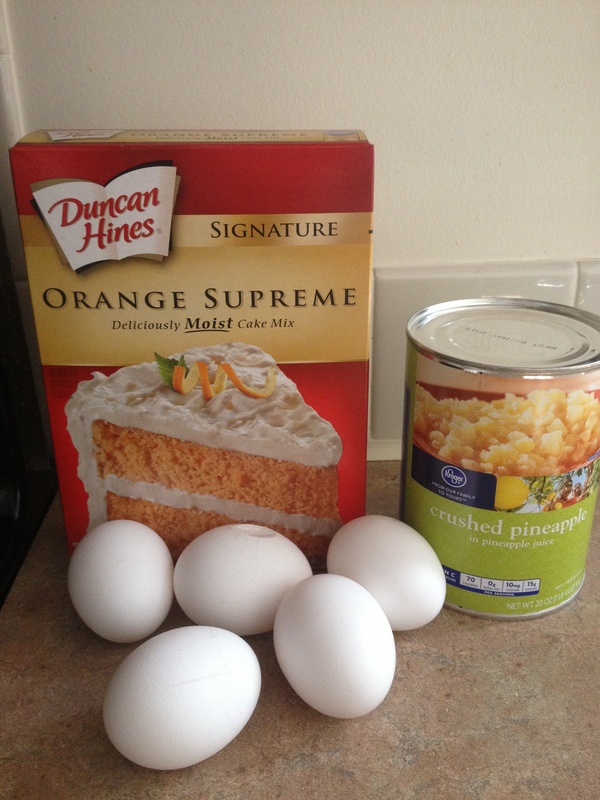 Mix cake, eggs, and pineapple together. 2. Pour into a prepared (sprayed with non-stick spray) glass 13×9 pan. 3. Bake at 350 for 35 minutes. 4. 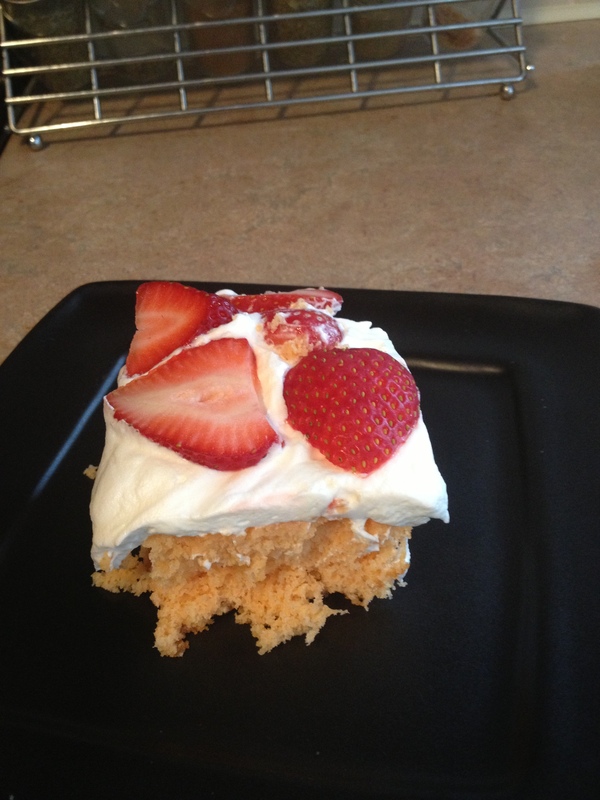 If desired, cool cake completely, and top with cool whip. Variations: The cool whip on this is totally optional. The cake is awesome without it. 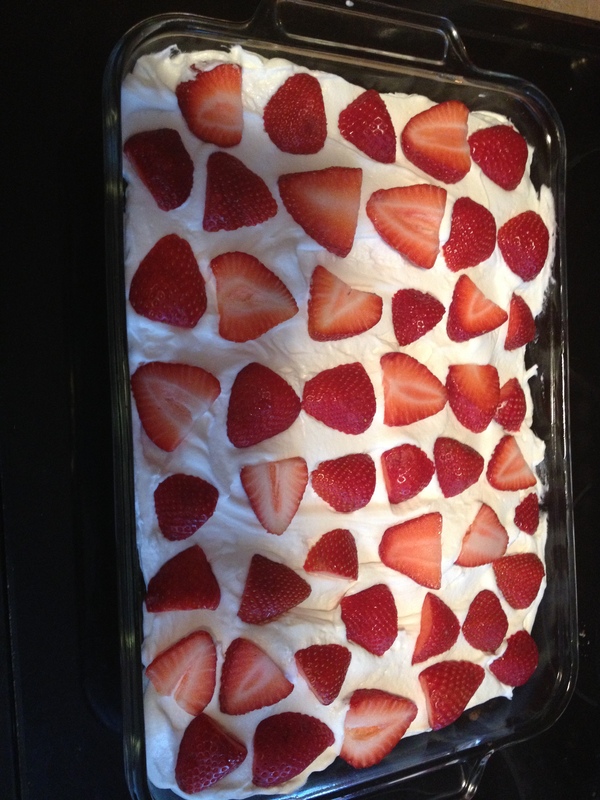 If you choose to do the cool whip, you could also top with fresh berries to make this extra pretty. You can also sub: white cake mix, orange, yellow, lemon, or angel food cake.